The church of Santa Pudenziana of Narni, together with the church of San Michele Archangel in Schifanoia, represents one of the most interesting Romanic edifices of the area of Narni. The structure, with the name of Santa Maria di Visiano, surges around the first decades of the 11th century using recycled materials coming from other roman and paleochristian edifices in the locality nowadays known as Visciano di Narni. 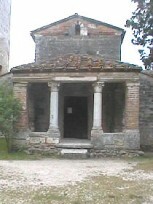 Externally it is characterised by a high belfry tower and a portico sustained by two marble columns with Corinthian capitals and two angular pilasters in masonry; inside it develops itself on a map with three bays with elevated presbyter and crypt. At the shoulders of the central altar in travertine, located under a pyramidal cupola, the semi circular space of the apse enlarges itself and welcomes the abbatial cathedra in rock. The wall superficies of the church of Santa Pudenziana is full of frescoes with votive paintings realised during the time going from the 13th to the 19th century, among which the precious "Madonna dei raccomandati" distinguishes itself.